Recent observations from NASA's Chandra X-Ray Observatory suggest that supermassive black holes may be spinning matter near the luminal* velocity. According to Einstein's theory of relativity, a mass spinning at such a great rate would make local spacetime itself rotate, causing surrounding matter to spiral inwards. As shown in the illustration below, black holes also emit jets of matter, due to strong magnetic fields. Image Courtesy of NASA/CXC/M. Weiss. 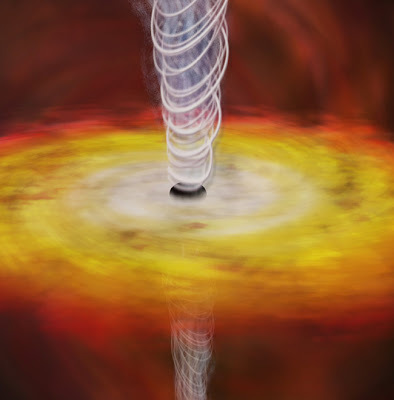 "We think these monster black holes are spinning close to the limit set by Einstein's theory of relativity, which means that they can drag material around them at close to the speed of light,"
Such incredible rates of spin could be the rule, instead of the exception. It is speculated that these subluminal* spin rates could be common in supermassive black holes, and could explain the jets of matter themselves. *Luminal velocity is the speed of light. It would then follow that subluminal velocities would be those just below the speed of light. Cheers pertaining to expressing this sort of important along with valuable data. You'll want reviewed a good deal for this theme. Anyone can comply with each of our search phrase Cash Advance I seriously take pleasure in you've got operate.